While more research is necessary to determine just how closely tied probiotics are to these health benefits, they can start to show positive effects when combined with other health regulating activities. As a type of healthy bacteria, probiotics are part of many fermented foods, such as yogurt, kimchi, miso, and pickles. However, these foods aren't always appealing to some palates, and certain probiotic types may be more helpful to your specific health needs. Selecting probiotic supplements may be better for you than incorporating foods into your diet. For the best probiotic supplements and foods, we've compiled our go-to guide to incorporating these bacteria into your lifestyle. Because probiotics are a type of microorganism, several different strains of bacteria count in this category. You should consider what benefits you want to get from your probiotics, as well as quality, shelf life, and more. Within each of these categories are even more specific strands that provide the benefits listed. If you're looking for a way to boost your health, it may not matter much to you which type of probiotics you purchase. However, if you're aiming to improve a specific condition, then you'll want to conduct more research into which strand best suits your needs. When buying a probiotic supplement, you need to exercise caution so that it will last long enough to give you health benefits as you go through the bottle. You should always make sure the label lists the genus, strain, species, dose, and number of organisms alive by the use-by date. If not, you may end up with ineffective supplements after your purchase. In addition to this information, you should also look for a seal from a third-party certifier. This label will show both the supplement maker's dedication to providing a quality product, as well as assure you that the probiotic will be useful. You can then compare all available information on the label to best purchasing standards. Remember how probiotics are living bacteria? That means they need to stay alive to be effective. For that reason, you need to pay attention to the number of colony-forming units (CFUs) when reviewing the label. That way, the probiotic will continue forming as a supplement and have a higher chance of being active when you take it. You should select a probiotic with at least 1 billion CFUs, but one with even more will stay active longer. However, you should only use those with more than 100 billion CFUs if recommended to by your doctor. These highly potent probiotics are best for those who don't naturally produce enough probiotics on their own and run the risk of cramps and bloating otherwise. If you're uncertain, talking with your doctor can help you determine the level of CFUs you should be seeking. Whenever you shop for anything, the cost ultimately becomes a factor. However, you shouldn't skimp on price when it comes to probiotics, as cheaper supplements typically aren't quality. You should be prepared to spend anywhere between $to $ on a supplement, depending on the strand. Like with many other supplements, you're likely to find probiotics in many different types. If you prefer one over the other—say, tablets over powders or liquids—then that will naturally influence your choices. Thankfully, one form of supplement isn't inherently better than the other, so you can select whichever one you like, so long as you still pay attention to all the necessary components on the label. Know that you don't have to limit yourself to just one type of supplement when you start to pick out which strain of bacteria best suits your desired health results. Studies suggest that probiotics can better work as a team than on their own. The two different strains support each other and can combat more difficult health issues and further improve symptoms. Another reason to select a multi-strain supplement is that it lines up with the theory of filling up your gut with more good bacteria to reduce the chances of any harmful bacteria taking root. It's no guarantee that bad bacteria won't find its way in, but giving more of your body's space and resources to the good stuff can at least help a little. With the rising popularity of probiotics, many new supplements are flooding the market, and some are better than others. You should pick out a supplement and strain that has significant research behind it, proving the probiotic as useful for your health needs. This process involves both a comparison of types, as well as how the specific supplement handles the bacteria. As everyone's health needs differ, you may have better luck with some supplements than others. Any probiotic supplement will help boost your health, though, so it won't hurt to try different brands in search of finding the best one for you. We mentioned the importance of how probiotics are living microorganisms before, and we'll do it again. These bacteria need to be alive to do your body any benefit, so you need to make sure you're picking up a supplement will do that, especially if you're picking one up off the shelf of a grocery store. By the point the probiotic has ended up in your hands, it's ridden in a truck and sat on the shelf for a while. That time is plenty for bacteria to start dying. When you're looking over the label, stay away from products that list the level of bacteria at the time of manufacture. Instead, you want to see how many bacteria are alive at the end of the expiration date so you can get a more accurate idea of the life of your supplement. Now that you know how to shop smart, here are our top picks for the best probiotic supplement and foods on the market. 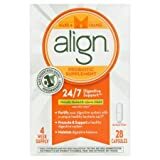 For a budget-friendly supplement that's still effective, Align does the job. It makes use of the probiotic strain Bifidobacterium, making it suited for help with maintaining healthy digestive balance and system. This supplement serves as an excellent choice for those who have trouble with caffeine and dairy products. One of the downsides to Align's supplement, however, is that it only has 1 billion CFUs at the time of manufacture so that it won't be at its most useful for long. When it hits the best by date, it'll only have 10 million CFUs, which is drastically below the recommended level. Still, for people who need an inexpensive option and aren't relying on it for other health conditions, Align is a good option. On the food end of the spectrum, yogurt is a healthy and delicious option that can also contain probiotics. However, you need to seek out containers that have live bacteria, as many brands kill them during processing. You should also be cautious of yogurts that have high amounts of added sugar to improve taste, as these aren't as healthy for you. 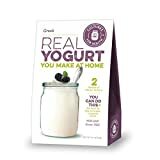 When you do find a yogurt that meets these qualifications, though, you're already on the way to picking up health benefits, In addition to the inclusion of lactic acid and bifidobacteria cultures, yogurt can also improve bone health, help with high blood pressure, relieve irritable bowel syndrome, and reduce diarrhea caused by antibiotics. The Islands Miracle probiotic supplements are an excellent choice for anyone who wants to improve their general level of digestive health. It contains nine different strains that help contribute to your digestive system, which plays into keeping bad bacteria out. This supplement is also gluten- and dairy-free, which makes them even more comfortable for already sensitive stomachs. While a dose of Islands Miracle has 30 billion CFUs, it does take two tablets to get that dosage. For people who aren't a fan of pills, that may be enough to get you to look elsewhere. Also, this supplement has a subtle sour smell to it (as many probiotics do), but it's something to consider to those who have sensitive noses. Most foods that have high levels of probiotics have gone through fermentation in some shape or form, and pickling cabbage is a great way to give yourself some healthy bacteria. Even better is that you can prepare pickled cabbage in several ways—sauerkraut and kimchi, to name a few—so you can mix up your menu on a regular basis. Like with yogurt, though, you want to be careful about what pre-pickled products you ended up purchasing. A lot of items on the US market go through pasteurization, which destroys many harmful bacteria. Unfortunately, it also kills good bacteria in the process. To make the most of your pickled cabbage choices, look for unpasteurized products or prepare your own at home. Besides giving the benefits to your digestive system, Florastor's supplement also helps boost your immune system. The presence of the Saccharo​​myces boulardii lyo strain stimulates the production of immunoglobulin A, a type of antibody. A daily supplement, you can take one to two capsules a day to get the benefits. This supplement is also resistant to antibiotics, which means it'll still be useful if you're on a long-term medicine for another condition. The immune boost is also likely to be helpful for you under those circumstances. It's best to at least wait two hours between taking your antibiotic and the probiotic, though, so they're not competing in your system. Kefir is an unusual little term that has its origins in Turkish. Keyif refers to feeling good after eating, which is what this food helps you do. Specifically, kefir is a fermented probiotic milk drink that comes from adding kefir grains to goat or cow milk. Kefir is a culture of lactic acid bacteria and yeast, and it has various health benefits. Like yogurt, kefir can help with some digestive problems, improve bone health, and protect against infections. It's also more effective than yogurt, containing several significant strains of friendly bacteria. Despite being a milk-based product, people with lactose intolerance can generally tolerate it well, though it does vary by individual. 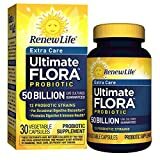 Renew Life's probiotic supplement has a high collection of bacteria strains that help improve the functions of your immune system. Some types are even helpful for reducing symptoms of autoimmune disorders—and this supplement contains four of the most effective bacteria strains at 30 billion CFUs per serving. It also has some of the most accurate labels out of all supplements, which is no easy feat. The larger size of the pills is one of the less appealing factors of this supplement. As such, they're a bit harder to swallow, but you only need one dose a day, so it may seem worthwhile for you. Renew Life also recommends cold storage for better preservation. Make sure the store also keeps it in a cold area and know that it may be a bit more work for you to remember to take it. Determining the best probiotic for your needs takes a lot of consideration of what you want from it and how you want to take it. The wide variety of supplements available gives you no shortage of options, while you can also gain some of this type of healthy bacteria by making smart food choices. For a way to get general health benefits and more targeted effects, see what the world of probiotics can offer.